Salary: - INR Rs. 5200 - 20200/- With 1800/2400/- Grade Pay. Application Fee: - For General/OBC Candidate Student Application Fee is - 400/- & For All Other Candidate Student (SC/ST/Woman) Application Fee is - Nil. 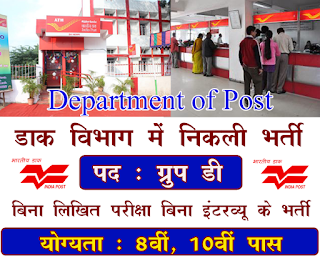 How To Apply: - All Student Need to Download application Form through official website http://www.indiapost.gov.in. After Filling The application form, the candidate must send hard copy of application along with relevant testimonials to the following Address before on The Last date 12-04-2017. Address: -Assistant Postmaster General (Estt./Rectt.) Room No. 205, 2nd Floor Office of the chief postmaster General, MP. Circle Bhopal - 462012. Last Date:-Last Date for Receiving of Offline Application Form Is :12-04-2017.